This is the site of a World War Two Chain Home radar station transmitter site, which had four steel towers, one of which was hit by a plane in July 1942.The receiver site is located 400m to the west (NHER 32538). The towers and operational buildings are defended by a series of perimeter defences, including four rare AM5 pillboxes. The site of a 'Buried Reserve', an underground transmitter block, is located 130m to the east in an adjacent field. Two masts remain on this site: one original Chain Home Transmitter Mast (No 4 of the 4) constructed in 1939 and one later communications mast. Radio masts, known as Stoke Masts. Must date from before 1939 as they were attacked during World War Two. One mast is a graceful structure, narrowing in steps towards apex, with 'webbed' corner bracing to girders, and is probably the oldest. Other, simpler masts could be more recent. In 1942 a bomber crashed into No.2 transmitting tower. Updated by S. Howard (HES), 2 November 2011. These were in fact some of the first radar defence aerials to be constructed in Britain. E. Rose (NAU), 19 January 1982. The top of one of the simpler masts removed. E. Rose (NAU), 2 September 1987. Blenheim collided with masts 18 July 1942; crew killed. Memorial placed on base of mast July 1992. E. Rose (NLA), 22 July 1992. Full description including defensive positions in (S3). It has been questioned whether the remaining aerials date from the War or were added afterwards. (S3) (copy under NHER 6799) refers to 'four wooden pylons' being demolished, though this might refer to NHER 32538. E. Rose (NLA), 12 May 1998. Yes the wooden pylons were indeed on NHER 32538.  states that the smaller of the two aerials on NHER 14227 dates from 1939, but the taller one is outside the original perimeter and is a communications mast of 1968. E. Rose (NLA), 24 August 2004. Entrances to T block walled up, and surrounding protective earth bank lowered in height to prevent children climbing on roof. No other works to be done until future of site decided. E. Rose (NLA), 10 December 2004. The central grid reference for this site has been altered from TG 258 027 to TG 2582 0284 and has been extended to the east to include additional defences. The site of a World War Two Chain Home radar station transmitter site is visible on aerial photographs to the north of the Poringland Road (S5-6). The receiver site is located 400m to the west (NHER 32538). The four steel towers and operational buildings were defended by a series of perimeter defences, including four rare AM5 pillboxes. The central grid reference for this site has been altered from TG 258 027 to TG 2582 0284 and has been extended to the east to include additional defences. Stoke Holy Cross radar station forms part of the main chain for the national Chain Home radar network, and its construction relates to a planned expansion of the original Chain network in late 1937 to early 1938 (S6), and was in operation by 1939. The site consists of four steel towers, three of which are arranged in a line, approximately 60m apart. It is clear from the square arrangements of concrete feet of the mast, that one of the transmitter towers has been moved from the expected position within the line to a new position 40m to the northeast (S5-6). An open-ended rectangular structure sits within the old tower site. The structure seems too high and of too even height to represent a radar platform and has the appearance of a blast wall. The transmitter block is located at TG 2582 0276 and is surrounded by a broad earthen bank. At TG 2570 0285 to the northwest of the block is another smaller earthen protected structure, this is likely to be the Stand-by-Set House, which maintained the power supply. At TG 2588 0278 is an underground operational building or shelter (S5). The roof of which has been exposed by 1949 (S6). The site of a 'Buried Reserve', an underground transmitter block, is located at TG 2600 0293, 130m to the east in an adjacent field. There is only a limited amount of information that can be provided by the aerial photographs for this underground structure. A square arrangement of four cubes, each 2m across, is located towards the western part of the site. The function of these is not clear, they may feasibly be similar to the square concrete observational cupolas that project out from underground battle headquarters. Evidence of additional structures is visible in the area to the east of the buried reserve, but having been removed prior to the date of the earliest available aerial photographs, nothing can be recorded of them other than the location. The perimeter of the site is defended by three AM5 pillboxes, at TG 2570 0281, TG 2577 0293 and TG 2588 0282. Two of these, the northern and eastern facing examples, have mounted gun positions on top, assumed to be Light Anti-Aircraft 20mm chimney mounts, as these were present on the pillboxes at the receiver site. Evidence of other smaller gun positions and weapons pits are visible within the boundary to the site, in particular to the north. A number of other type 22 pillboxes provided protection to the east (NHER 52472) and the south (NHER 31129 and 52471). The remainder of the site consists of operational and administrative buildings, including a number of nissen huts, and guard huts. 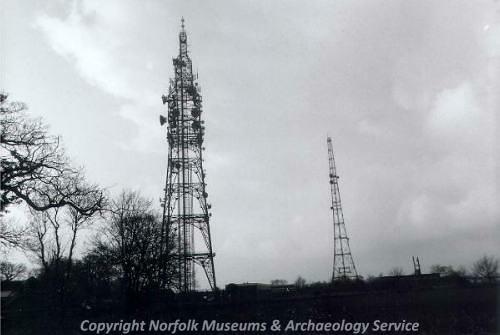 Staff at the RAF Air Defence Radar Museum have confirmed that one of the current masts is an original Chain Home Transmitter Mast (No 4 of the 4). The platforms have been removed, but the remaining tower is the original structure. H. Hamilton (HES), 09 October 2013. --- Photograph: Rose, E.. 2001. JXD 35-36. --- Verbal communication: Bailes, D.. 2004. 24 August. <S1> Correspondence: Radio Department, RAE. 1942. Report of visit to Chain Home Station at Stoke Holy Corss, to inspect aerial curtains damaged by aircraft..
<S2> Newspaper Article: 1992. Eastern Daily Press. 22 July. <S3> Article in serial: Bird, C.. 1992. The Fixed Defences of North and East Norfolk in the Two World Wars. Part II.. NIAS Journal. Vol 5, no 2. <S4> Serial: Dobinson, C.S.. 1996. Twentieth Century Fortifications in England.. Vol I.4, p 590. <S5> Vertical Aerial Photograph: RAF. 1946. RAF 106G/UK/1429 4154-5 16-APR-1946 (NMR). <S6> Vertical Aerial Photograph: RAF. 1949. RAF 541/390 4021-2 10-NOV-1949 (NMR).